The statement Jesus made when he saw people buying and selling in the temple is still relevant today in our churches all over the world. The business activities going on in most of our churches have made a wall of separation that blocked the people away from God right in the house of God. 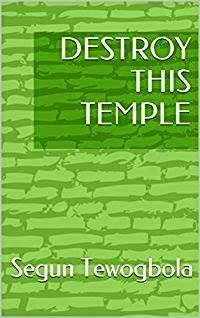 Destroy This Temple is a must read for all those that really want to know God and serve Him in spirit and in truth. We must put the middlemen away and determine to know God in person and in the spirit, because God is Spirit. You too can join us after readng this book to move God's people from a Monument to a Movement with the task of spreading the knowledge of God's glory all over the world as the water covers the sea.